Nak’s Oriental Market on Chestnut St. has been a Menlo Park treasure for almost 50 years with its eclectic selection of Asian and Dutch products. Add exotic fruit to the mix, thanks to Ken Kurose, the son of owners Sam and Ikie. The Jackfruit (Ken is holding a halved fruit; photo of whole fruit is below) is a bit menacing looking and can grow as large as 50 pounds. When making his selection at the produce market, Ken looks for just a hint of mold growing on the fruit’s outer skin as well as a sweet smell. “This fruit is extremely sticky,” he explains. “When cutting into the fruit, you should wear gloves and use oil on the knife — and also use a lot of newspapers, so it doesn’t get sticky everywhere. 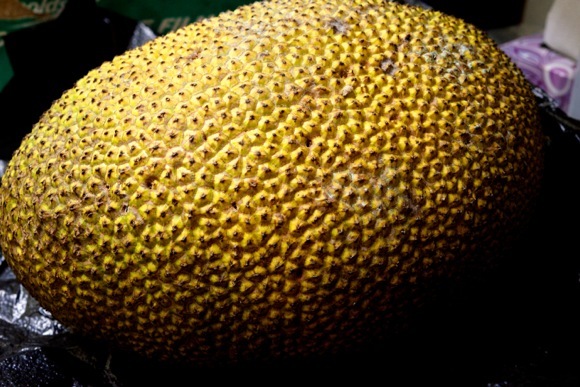 When ripe, Jackfruit can be eaten raw and has a flavor comparable to apple, pineapple and banana. It’s used to make custards and cakes, and at least in India, ice cream. The seeds can be roasted and taste a bit like chestnuts. 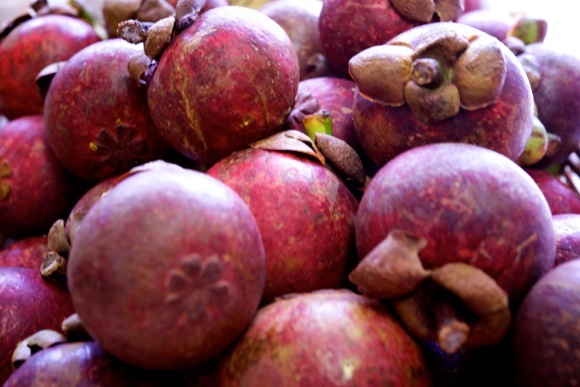 Ken says the other exotic he’s offering — purple mangosteen (pictured above) — has found instant fans; he bought 45 pounds the Friday before Easter and sold out by by Monday. 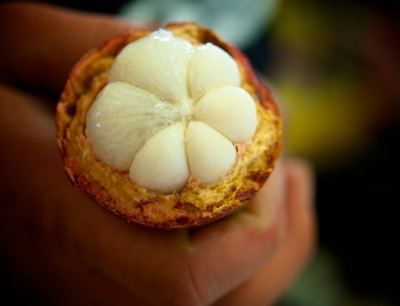 A not particularly appetizing-looking fruit from the outside, when slit open — Ken scores the skin with a key — the interior reveals a half dozen “cloves” of fruit, called aril. The taste is refreshing — both sweet and tangy — with a texture a bit like kiwi and a fragrance that reveals a hint of citrus. The reddish-colored rind is inedible, but when pressed with a finger, it gives a clue to the fruit’s ripeness. “If indented or soft, it may be overripe,” says Ken.